The British Columbia wild mushroom soup tastes just right – smooth and rich with truffle cream and an appealingly earthy mushroom flavor – and the sides of baby beet greens and blue cheese round off the dish nicely. It’s not what you’d expect to eat in an airport, let alone an airport hotel restaurant. 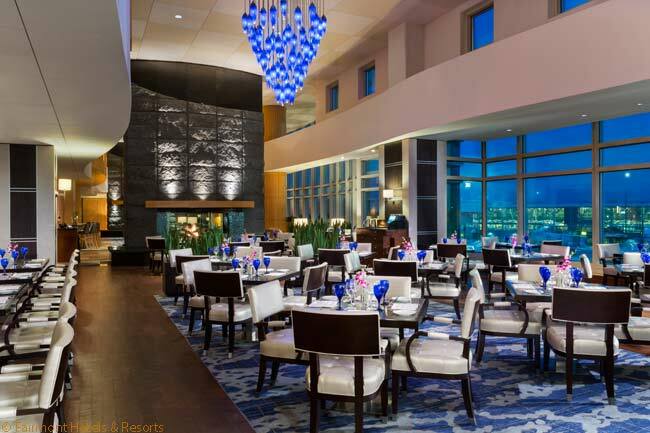 But casually elegant Globe@YVR is not an average airport hotel restaurant – and the Fairmont Vancouver Airport Hotel is no run-of-the-mill airport hotel. 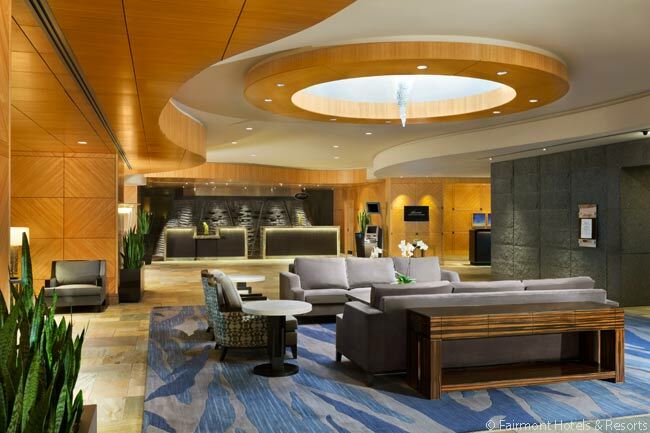 The Fairmont Vancouver Airport Hotel is part of a welcome trend – the advent of decent-to-excellent hotels in or near major international airports – that has ramped-up globally over the past decade or so. The hotel, in fact, helped start that trend when it opened its doors in 1999. 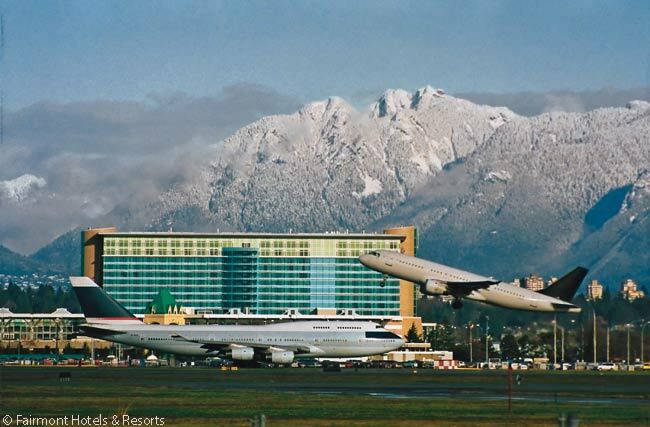 There are several in-town hotels in Richmond BC designated as airport hotels, and indeed they are conveniently located within a mile or two of Vancouver International Airport (IATA code YVR). However, the Fairmont is the only hotel actually built into the airport complex. It’s ensconced in the main passenger terminal, a two-minute walk from Canadian and U.S. Customs and Immigration stations that screen passengers on flights to and from the United States. I have stayed there twice – once shortly after it opened, and again in 2014. 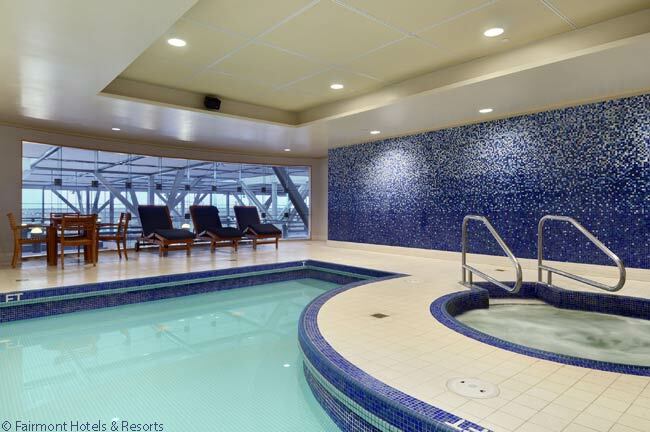 Last year, I stayed in the 392-room property for three nights, alighting at Vancouver International after a two-hour flight from San Francisco International Airport (SFO). I flew to British Columbia to write a travel feature article about the city of Richmond, where the airport is located. The Fairmont Vancouver Airport Hotel, run by Toronto-based Fairmont Hotels & Resorts, proved a fine base for exploring Richmond. A city of 190,000 located across the north arm of the Fraser River from Vancouver, Richmond is considered Canada’s most Asian city, thanks to Asian Canadians who make up 60 per cent of Richmond’s permanent residents. A five-minute stroll through spacious, light-washed YVR took me to the airport’s elevated Canada Line SkyTrain station. Just 10 minutes later, the train put me in the urban heart of sprawling Richmond, which incorporates suburban developments, Asian (especially Chinese) temples, shrines and shopping malls, prime agricultural land, waterways, a fishing village and smartly repurposed former fish-processing plants and warehouses. And restaurants, lots of restaurants, especially Chinese. The rail line, built for the 2010 Vancouver Winter Olympics, continues to downtown Vancouver, 25 minutes from YVR. When not out and about, I hunkered down at the hotel. The handsome hotel lobby is located one floor up from the terminal and is reached by a quick elevator ride, staircase or escalator. In the sleekly modern lobby, next to the bank of lifts, guests can slip into the well-stocked and welcoming Jetside Bar. It’s a congenial spot for a pre- or post-dinner drink, or pre-flight lubrication. In the years I’d been away from the property, which is typically used by guests for short stays – it offers a special six-hour day rate during airline layovers – I wondered how well it had held up to the constant turnover. Quite well, it turns out – not just in the public spaces but also in its guest rooms, which have evidently been refreshed, perhaps multiple times, in the hotel’s 16 years. My spacious room overlooked passenger gates and the taxiway. Happily, it was nicely sound-proofed. Some sounds seeped through the triple-planed windows, but the roar of jet engines and service vehicles was a softly muted sound, not disruptive noise. I slept well on the large, comfortable bed and worked in an ergonomic chair at an oval-shaped in-room desk equipped for electronic devices. Through the floor-to-ceiling windows, I watched the dance of aircraft arrivals and take-offs and gazed at the North Shore Mountains from the airport’s location on Sea Island in the Fraser River delta. I was pleased to discover generous closet space, often a shortcoming in airport hotels. The bathroom was sparkling, nice-sized and well-lit – no dim or harsh lighting – and had both a bathtub and a separate shower. The Fairmont Vancouver has the requisite bells and whistles expected by travelers who book into a 4-star property: spa, health club, 24-hour business center, 8,800 square feet of meeting space. Because I was eating, sightseeing and roaming around Richmond most of the time, I didn’t use all these facilities, but if they’re up to the level of the services I did use, the hotel well-deserves its fourth star. Few travelers go to airports for sport, but if you’re in YVR and have time, the airport – Canada’s second-busiest, after Toronto Pearson International (YYZ) – is worth a walkabout. Vancouver International is easy on the eye, often relatively uncrowded in the international passenger area (not so in the area for domestic Canadian flights), and festooned with shops selling maple syrup, maple sugar candy, smoked BC salmon and Canadian favorite Tim Horton’s doughnuts. The international arrivals area is graced with beautifully carved Native totem poles and artwork and a man-made waterfall flanking the stairs and escalator. Most waiting areas have natural light. Fairmont operates some 60 properties around the world, among them London’s venerable Savoy Hotel, Shanghai’s Peace Hotel and San Francisco’s 1907 namesake Fairmont Hotel. 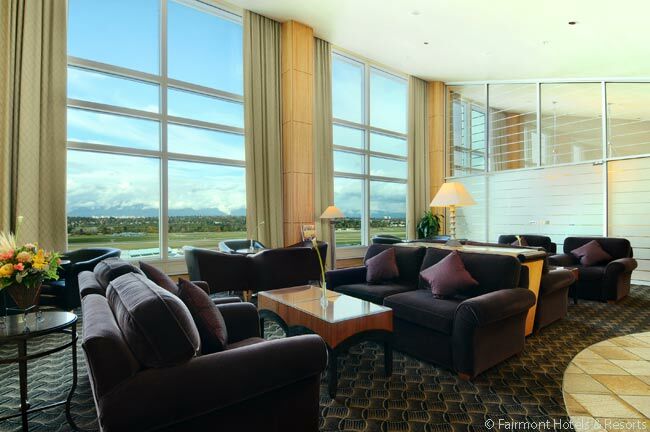 The Fairmont Vancouver Airport Hotel doesn’t have their pedigrees, but it is one of North America’s prime airport hotels and can easily hold its own in global competition. Just after check-out, I lunch at Global@YVR on tender thyme- and garlic-roasted lamb rack and pulled braised lamb shank accompanied by lemon-scented quinoa tabouli, braised eggplant and roasted red pepper, accompanied by a glass of robust B.C. red wine. Thus sated, my wheelie and I head off to U.S. Departures right downstairs and the return flight to San Francisco. 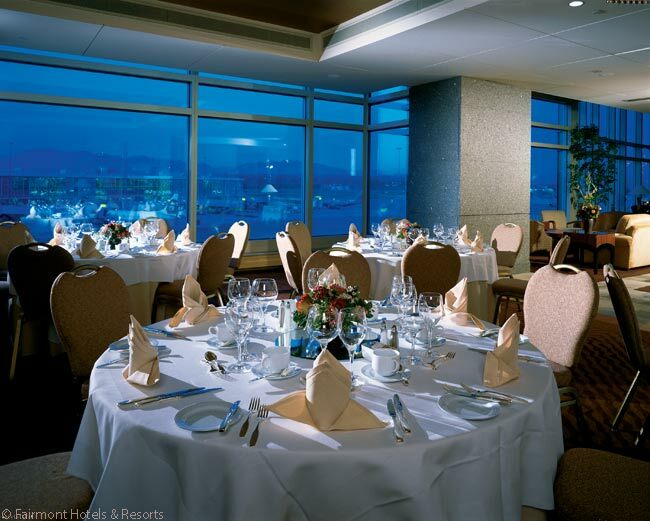 The Fairmont Vancouver Airport Hotel is located inside Vancouver International Airport at 3111 Grand McConachie Way, Richmond, British Columbia, Canada V7B 0A6. 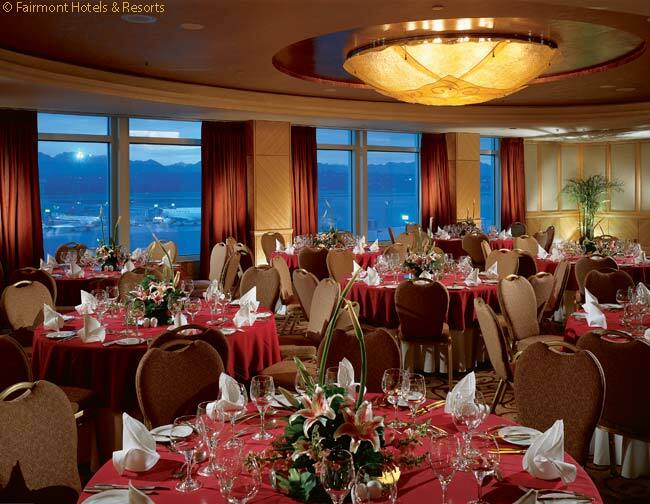 To book or for more information, call +1 604-207-5200, or visit www.fairmont.com. 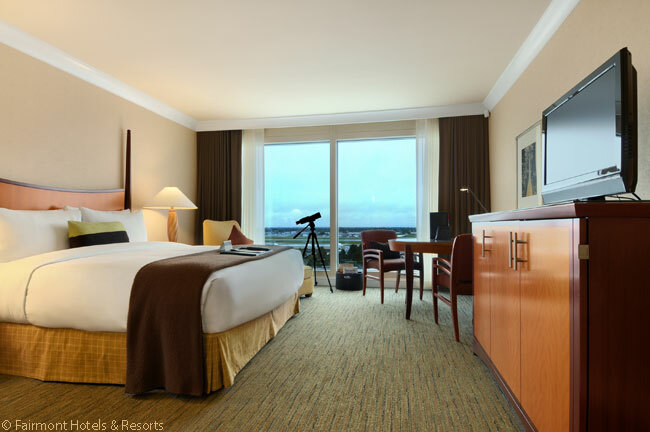 Nightly room rates start at C$319 (US$266).